Acheulean 600.000 - 100.000 b.c. - De website van pangeobest! Acheulean 600.000 - 100.000 b.c. Acheulean, from the French acheuléen, is an archaeological industry of stone tool manufacture characterized by distinctive oval and pear-shaped "hand-axes" associated with early humans. Acheulean tools were produced during the Lower Palaeolithic era across Africa and much of West Asia, South Asia, and Europe, and are typically found with Homo erectus remains. It is thought that Acheulean technologies first developed in Africa out of the more primitive Oldowan technology as long ago as 1.76 million years ago, by Homo habilis. Acheulean tools were the dominant technology for the vast majority of human history. Mousterian 100.000 - 40.000 b.c. 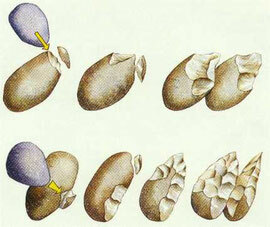 Aterian 80.000 - 40.000 b.c. Solutrean 21.000 - 17.000 b.c. Magdalenian 17.000 - 12.000 b.c.